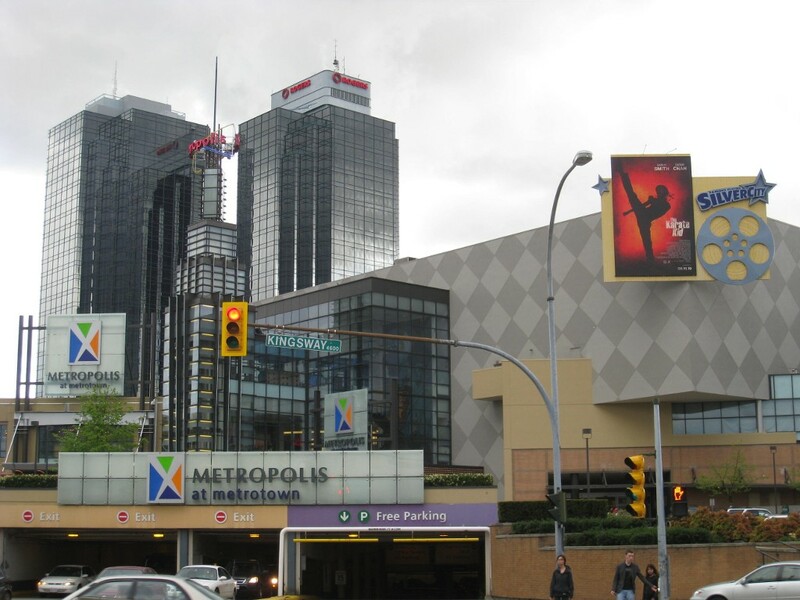 Metropolis at Metrotown (formerly known as Metrotown Centre, Eaton Centre Metrotown or Metro as an abbreviation) is a shopping mall complex in Burnaby, British Columbia, Canada. With over 450 shops and services, it is the largest mall in British Columbia, and the 2nd largest in Canada. The mall is connected by a skyway to the Metrotown Station on the SkyTrain rapid transit system. Two office buildings are part of the complex, with a third under construction. The word "Metrotown" has now come to apply to the parts of Burnaby that surround the mall, particularly the commercial and residential areas for several kilometres east and west along Kingsway. Previously, this neighbourhood was referred to as West Burnaby. Since the mid-1980s, the neighbourhood has undergone extreme "densification", thus reflecting the official community plan for the area, created and adjusted in anticipation of SkyTrain construction. Some businesses across Burnaby's nearby western municipal border, in the City of Vancouver's Collingwood neighbourhood, use the Metrotown name, even though most residents would consider them outside of the region covered by the term.